November 30, 2018, Kelowna, B.C. – The Canadian Homebuilders of the Central Okanagan (CHBA-CO) is pleased to announce the Finalists for the 2019 Tommie Awards. The Tommie Awards is an annual awards program that celebrates excellence in home building and renovation within the Central Okanagan. To be eligible for a Tommie Award, members of the CHBA-CO submitted entries that were built, renovated, developed, created and/or marketed during the period of January 1, 2017 – September 30, 2018. The finalists and winners are selected by a panel of out-of-town industry professionals. “The success of the Tommie Awards couldn’t happen without a strong and supportive industry. The Awards’ continued success is a testament to the tireless efforts and dedication of the Canadian Home Builders Association, that works every day to promote and showcase world class projects and communities in the Central Okanagan.” said Kevin Santos, Tommie Awards Chair. 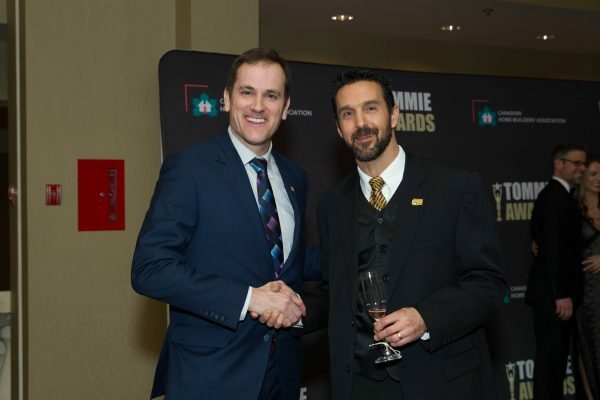 Photo Caption: Central Okanagan MP Dan Albas pictured with longtime CHBA-CO board member, Chuck Cullen with Team Construction at the 2018 Tommie Awards. The 27th Annual Tommie Awards Gala will be held on January 19, 2019 at the Delta Grand Okanagan Hotel. A Champagne Reception will start at 5:00pm with the Program and Entertainment to begin at 6:00pm. CHBA CO is the regional voice of the residential construction industry in the Central Okanagan. It represents more than 250 members and is part of an affiliated network of nine local home building associations located throughout the province. The industry contributes over $23.1 billion in investment value to British Columbia’s economy creating 158,000 jobs in new home construction, renovation, and repair. One in five employees in British Columbia work in the home building industry.